Emerald: Apostle Anselm Madubuko's wife, Connie is dead. 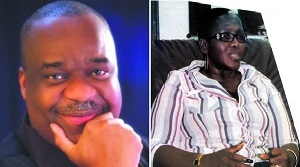 Apostle Anselm Madubuko's wife, Connie is dead. Pastor Connie Madubuko, wife of the Senior pastor and founder of Revival Assembly, Lagos, Apostle Anselm Madubuko is dead. She slumped and died in the early hours of July 7, 2012. Due to the fact that she was not in any way sick, cardiac arrest as speculated may be the cause of death. “Pls pray for my kids and I .....thank you Jesus and thanks to u all”. She was survived by her husband and 3 children. God give the family the strength to bear the loss and may her soul rest in peace.